Example of visualization of data from the Tropospheric Emission Spectrometer. 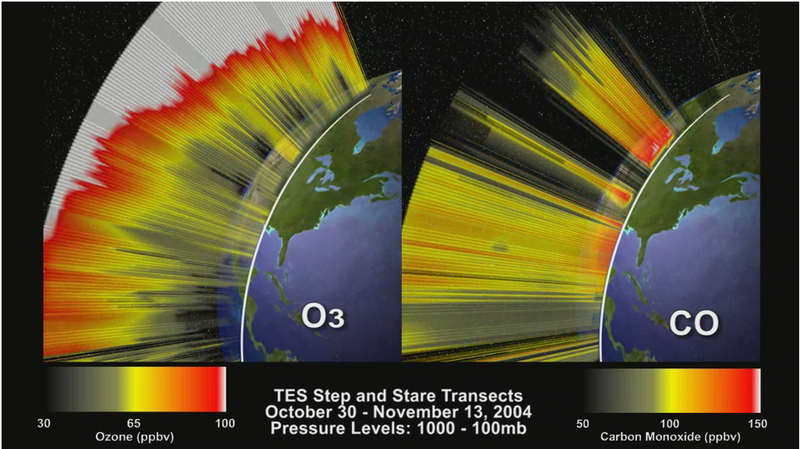 These frames are from an animation that steps through transects of the atmosphere profiling vertical ozone and carbon monoxide concentrations, combining all tracks of the Aura satellite during a given two week period. Get used to it. Weather reports of the future are going to tell you a lot more about the atmosphere than just how warm and rainy it is. In the same way that satellite observations of Earth revolutionized basic weather forecasting in the 1970s and 80s, satellite tracking of air pollution is about to revolutionize the forecasting of air quality. Such forecasts could help people plan around high levels of ground-level ozone–a dangerous lung irritant–just as they now plan around bad storms. “The phrase that people have used is chemical weather forecasting,” says Kevin Bowman of NASA’s Jet Propulsion Laboratory. Bowman is a senior member of the technical staff for the Tropospheric Emission Spectrometer, one of four scientific sensors on NASA’s Aura satellite. Aura and other NASA satellites track pollution in the same way that astronomers know the chemical composition of stars and distant planetary atmospheres: using spectrometry. By breaking the light from a planet or star into its spectrum of colors, scientists can read off the atmosphere’s gases by looking at the “fingerprint” of wavelengths absorbed or emitted by those chemicals. From Earth orbit, pollution-watching satellites use this trick to measure trace gases such as carbon monoxide, nitrogen oxide, and ozone. However, as Bowman explains, “Polar sun-synchronous satellites such as Aura are limited at best to two overpasses per day.” A recent report by the National Research Council recommends putting a pollution-watching satellite into geosynchronous orbit–a special very high-altitude orbit above the equator in which satellites make only one orbit per day, thus seeming to hover over the same spot on the equator below. There, this new satellite, called GEOCAPE (Geostationary Coastal and Air Pollution Events), would give scientists a continuous eye in the sky, allowing them to predict daily pollution levels just as meteorologists predict storms. Learn more about the Tropospheric Emission Spectrometer at http://tes.jpl.nasa.gov.